Independence Day Will Smith, Bill Pullman, and Jeff Goldblum star in one of the all-time great popcorn pleasures. Aliens attack the earth and it takes a quirky engineer, a plucky President, and a heroic military pilot to save the day. What does that have to do with the 4th of July? Listen to the President’s stirring pep talk. 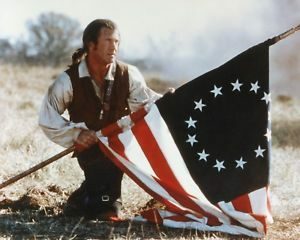 The Patriot There are many films about the Civil War, but not many about the Revolutionary War. Mel Gibson stars in this uneven but stirring film about a farmer pulled into the rebellion. 1776 I love this film, based on the Broadway musical about the signing of the Declaration of Independence, with almost all of the stars from the acclaimed stage production, including William Daniels as the “obnoxious and disliked” John Adams, Ken Howard as a dashing Thomas Jefferson, and Howard Da Silva as Benjamin Franklin. And don’t forget Schoolhouse Rock!